Black-eyed Susan vine plant is a tender perennial that is grown as an annual in temperate and cooler zones. You can also grow the vine as a houseplant. 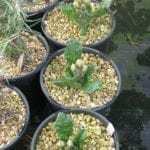 Try growing one with tips from this article. If you?re fond of the cheery black eyed Susan flower, you may also want to try growing black eyed Susan vines. Grow the vine from seeds as a hanging houseplant or an outdoor climber. This article will help.